Credit card receipt and invoice from the Richfield Oil Corporation, dated May, 1963. 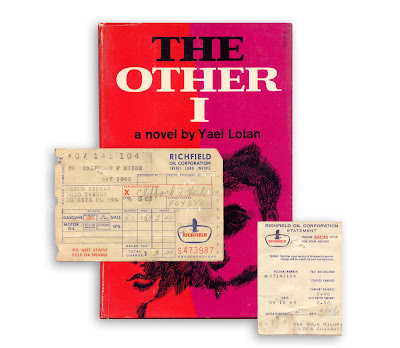 Found in "The Other I" by Yael Lotan. Published by Bobbs Merrill, 1962. As I look closer, I see that there are all kinds of dates on there, but the general time period is correct. It would be very interesting to compare the price of oil then to the price now. i remember when gas receipts looked like that. I absolutely love this blog. At first, I didn't think much of it, but it's really cool the kinds of things you manage to find in these books. I'm so happy to have run across your blog. What a lovely combination of bibliophilia, sentimentality and curiosity it "speaks to" in me. I recently borrowed a book of poetry from the library and brought it home only to find an envelope with a note card inside addressed to ME! Guess what I had used as a bookmark the last time I borrowed the book?! I was delighted to get the card back as well as a good chuckle. But it makes me think: I wonder what stories we each tell by the random tidbits of ourselves we unwittingly leave behind in our lives. When gas was $0.359 (?$0.369?)! I too love history, old books (see, for instance, http://veronicawaldsamusingmusings.blogspot.com/2009/06/trees-and-shrubs-of-rocky-mountain.html, though it was so pristine it didn't even have a bookmark in it - the little sticker at the back identifying the booksellers was as close as it got) and glimpses into lives of the past. SO clever and enjoyable of you to archive and appreciate these wonderful tidbits!